If you love olives …. 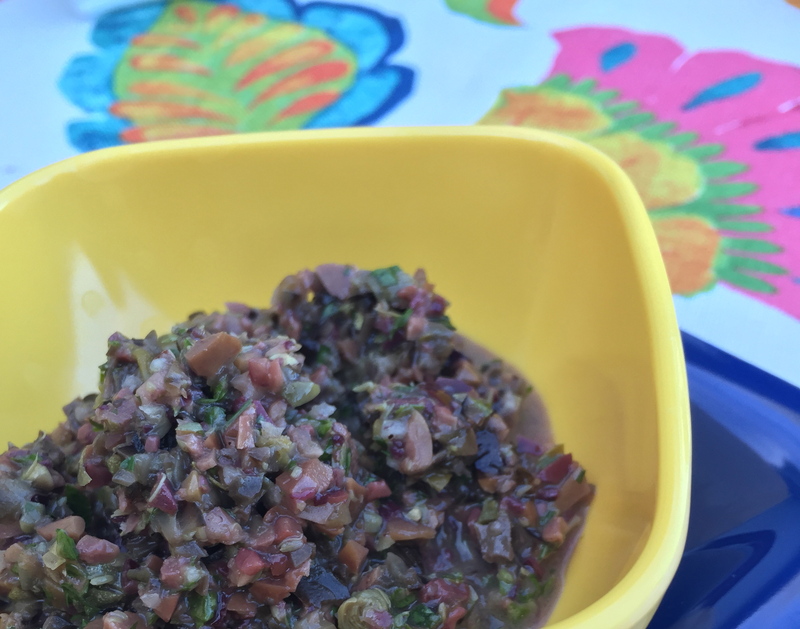 why haven’t you tried tapenade?? This is more simple than you can even imagine, and absolutely delicious. Toss it all into a food processor and whiz it up – taste and season with salt and pepper. Serve with crackers, fresh baguette, or crisp pita triangles. This potato salad is light and refreshing – so unlike the mayonnaise or sour cream versions – perfect for warm summer evenings. 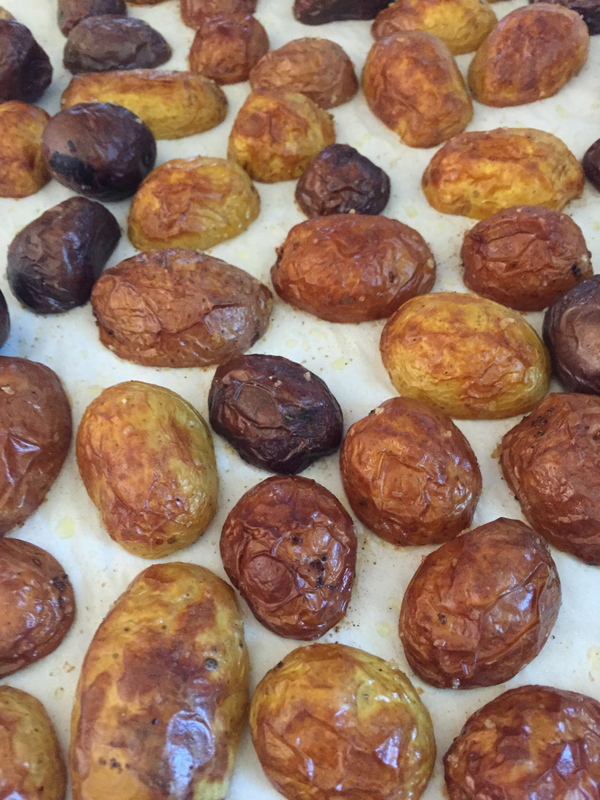 I like to use a variety of little potatoes, toss with olive oil, salt and pepper. Roast on a baking sheet – don’t crowd them – they roast much better with a little space. 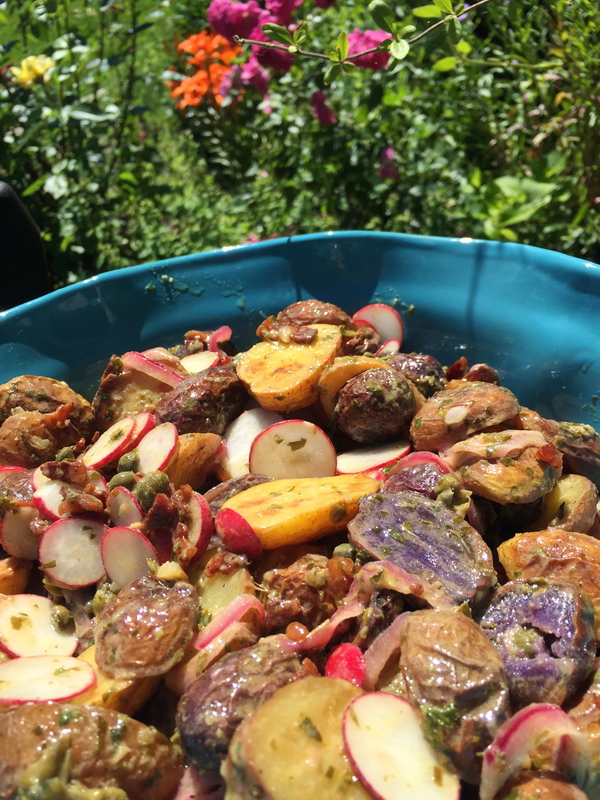 A perfect fresh potato salad, crunchy and tangy – love it. Blend all ingredients together until smooth and creamy – toss over vegetables when potatoes are still warm. Serve at room temperature. I felt like making a special dinner tonight …. will be away for 9 days without Grant, in Phoenix. Nope, not for shopping, or golf, or even the spring training going on at the ball diamonds. No, Hayley is having surgery again, and we are putting our trust and all our hope in the physicians that we have grown to know and love at the Mayo Clinic. I often make a rolled, stufed sole dinner but this one was so delicious it had to get on the blog before I forget what I did … something I am known for…. Serves 2, but of course, feel free to adjust for however many people you are serving. In a small saucepan soften minced shallot in 1 tbsp olive oil, and 1 tbsp butter. When softened, remove half the shallots to a small bowl. To the rest of the shallots, add 2 tbsp good, dry white wine and 1 tbsp white wine vinegar. 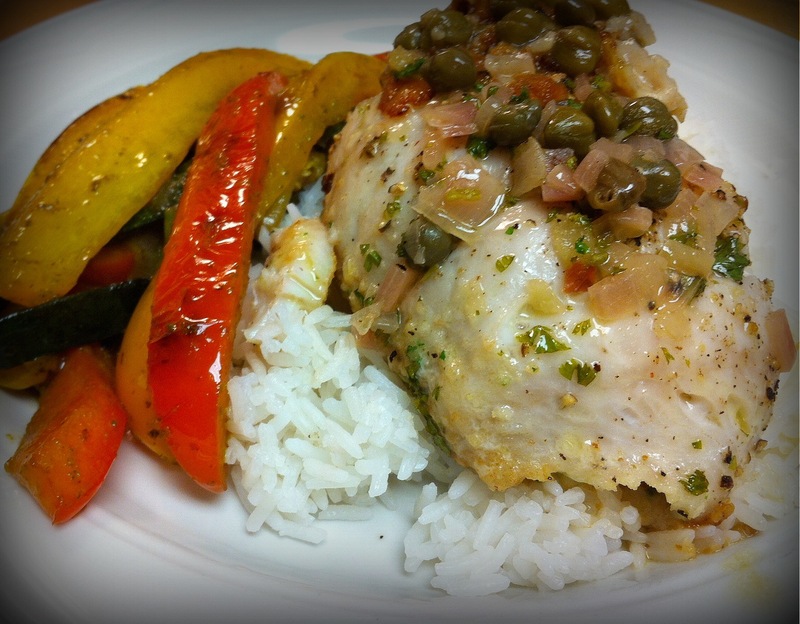 Allow to cook just enough to reduce a bit, and add the capers. Add another 1 tbsp of butter and allow to keep warm. To the reserved shallots add the bread crumbs, salt and pepper to taste and 1 tbsp chopped fresh parsley. 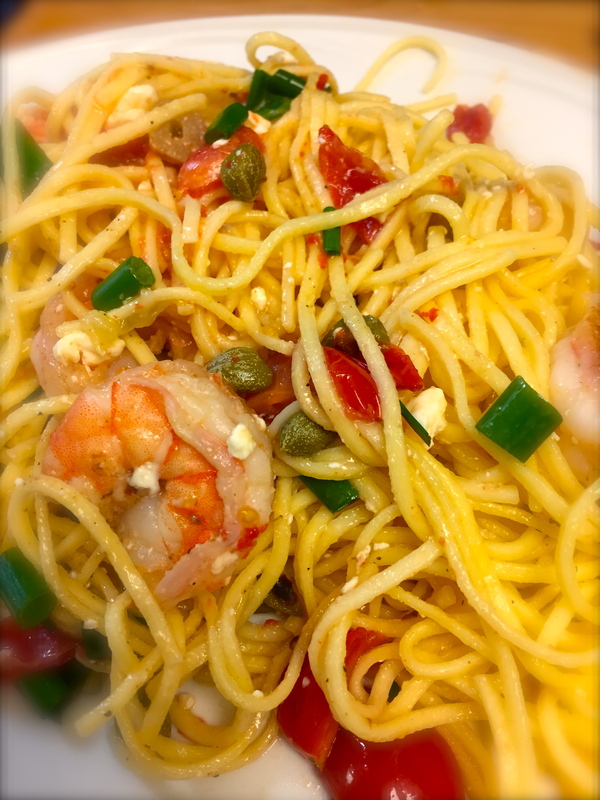 Season the sole fillet with salt and pepper, lay the shrimp/prawn down at the thick end and sprinkle the bread crumb mixture on. Roll up tightly and allow to rest. Heat an oven proof saute pan, melt a little butter with oil and gently place the rolled fillets in. Place in preheated oven (350) and cook for 25 minutes. Be watchful for this – depending on the size of your fish, and your stuffing, it could take as little as 20 minutes, or as much as 30. Do not overcook your fish – as soon as it flakes easily it is done. Remove from heat, stir the remaining parsley into the butter caper sauce, and season with freshly squeezed lemon juice and adjust seasonings with salt and pepper. Drizzle over the fish. Lightly rub chicken breasts with lemon juice and a wee bit of olive oil. Combine all the spices and sprinkle over the chicken, allow to rest for a bit. Melt butter in large skillet over medium heat. 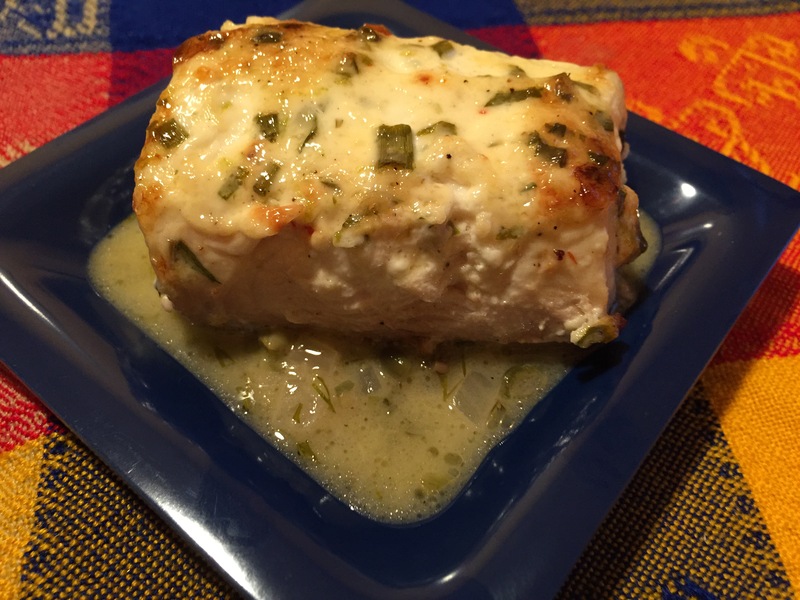 Increase heat to medium high and add chicken breasts – turning often until they are browned – about 5 minutes. Turn heat down to medium again and cook for a further 7 minutes, until chicken is just barely cooked through. Remove chicken to a warm serving platter and keep warm. 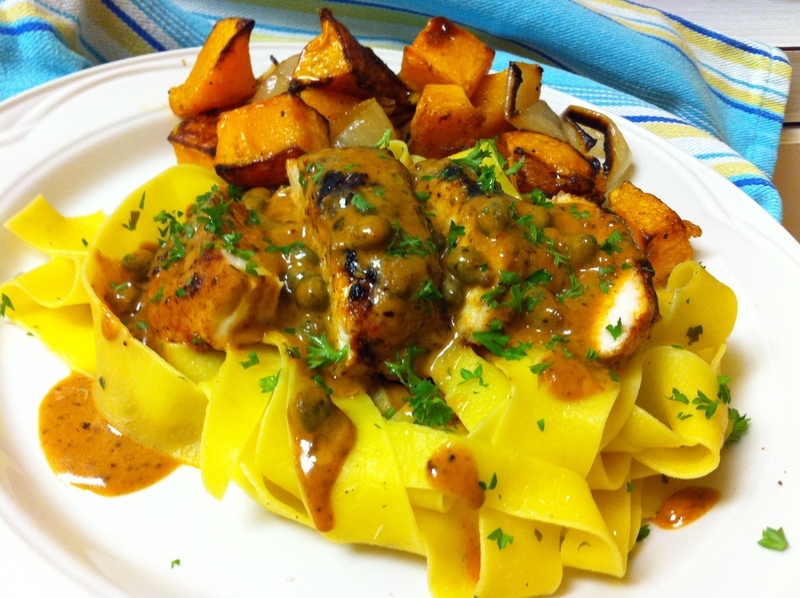 Spoon over the chicken breasts, garnish with parsley, lemon slice and serve over a bed of herbed noodles. Variation: Use dill weed instead of paprika! Combine all ingredients in a jar and shake well to blend. I like to at least double this recipe and keep it in the fridge – a really great, simple dressing that tastes fabulous on vegetables, grilled chicken or fish, or just plain greens. Toss all vegetables together with a small amount of the dressing and allow to rest just so the tomato juices flavor everything right through. I like to wait until just before serving before I add in the bread cubes and a bit more dressing – I love my croutons still crunchy! 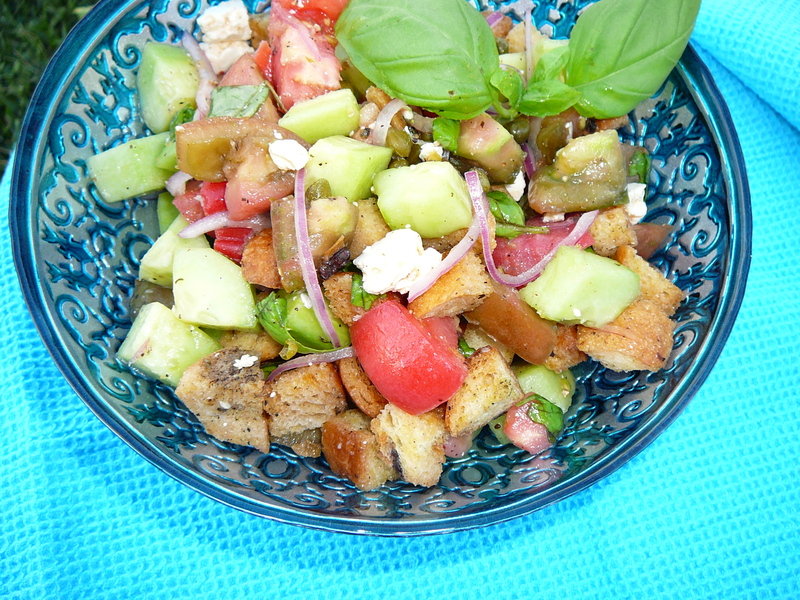 For the bread I prefer to make croutons out of slightly stale bread – just chop them into your favorite crouton size piece and toss in a plastic bag with a variety of herbs, salt and Pepper – drizzle with a little olive oil and give it a good shake. Toast in a toaster oven, or in a fry pan until the bread is really well toasted and crunchy – allow to cool.